By mid-nineteenth century, the French, well entrenched on the island of Gorée, were developing the tip of the Dakar peninsular , and constructing a port. In 1872, Britain appointed its first vice-consul, unpaid and a Frenchman. The first British vice-consul from Britain, Lt Col Allan Maclean, arrived in 1894, and became a consul two years later. He leased the only house he could find that was remotely suitable, Villa Belle Vue in Rue Huart, from a Monsieur EA Offret. It was barely affordable because prices and rents were high as a result of the merchant class gradually moving into the new town of Dakar from Gorée. Maclean’s stone villa was recently built and overlooked the sea, but was small, with its two floors connected by an unsheltered external stone staircase: he used the ground floor as offices and lived above. When the landlord threatened to sell the house in 1896 Maclean appealed unsuccessfully to London for its purchase. Offret must have relented because the Villa Belle Vue was still the British consulate when Captain Charles Cromie took up duty as consul in 1902. In that year the governor-general of French West Africa decided to move his seat of government from St Louis to Dakar, and told Cromie that the French government would welcome the construction of a proper British consulate and would do all it could to procure a suitable site on favourable terms. London was not keen but Cromie persevered. The Director of Public Works in Dakar proposed a site on the Plateau, just south of the colonial hospital and next to Bernard Bay. The owner was W Teisseire, the Mayor of Dakar. The Treasury eventually agreed, in December 1903, to the expenditure of £8,000, comprising purchase of this 4,500 square metre plot for £1,450, construction of a consulate on it for £6,000 and, since the consulate would be a mile or so from the port, acquisition of a shipping office on the sea front for £550. Cromie recommended that the house should be built around an internal court as the best defence against the strong northerly trade winds for two-thirds of the year and the tornadoes, driving rain and thunderstorms from the south-east during the rainy season. The Office of Works commissioned Arthur Vye Parminter, an English architect practicing in Paris, to design the house and tenders for its construction were invited from three French firms. Only one tender was received, in November 1906, and at a figure three times the Treasury approval. Although the firm subsequently offered a much lower figure, the Office of Works instead decided to build the house themselves, using local labour and materials as far as possible; sourcing unavailable materials from Britain, and sending one of their officers, WC d’Harty, to supervise the works on site. The Office of Works warned the Treasury that the house itself would not cost less than £8,500: but there was no longer a need for a shipping office because the newly-appointed vice-consul was a local agent and had his own office. 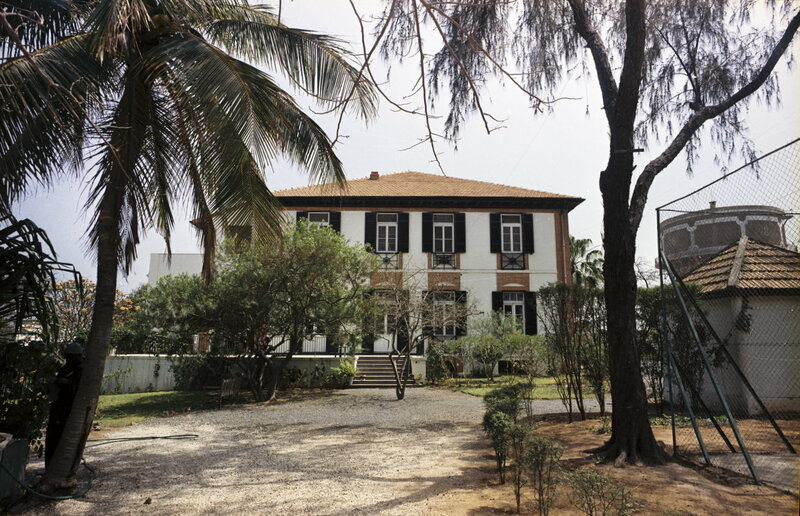 The house was completed in February 1908 but not occupied until John Baldwin arrived as consul-general for French West Africa in May 1908. He had no complaint about the planning of the house but despaired at how much water leaked in and how shoddy and broken were the fittings. He thought the only answer would be to surround the house with a verandah. Thrift Reavell, one of the Office of Works architects in London, visited in 1909: he recommended enclosing the central court and building a two-storey veranda on the sides that faced the weather. He thought that Baldwin was somewhat exaggerating on some of the smaller points. The courtyard was accordingly roofed over in 1912, when electric light was also installed and a tennis court laid. The gardens were laid out in 1916 and heavily planted with fruit trees and shrubs, not least in the hope of providing some protection from sand storms. 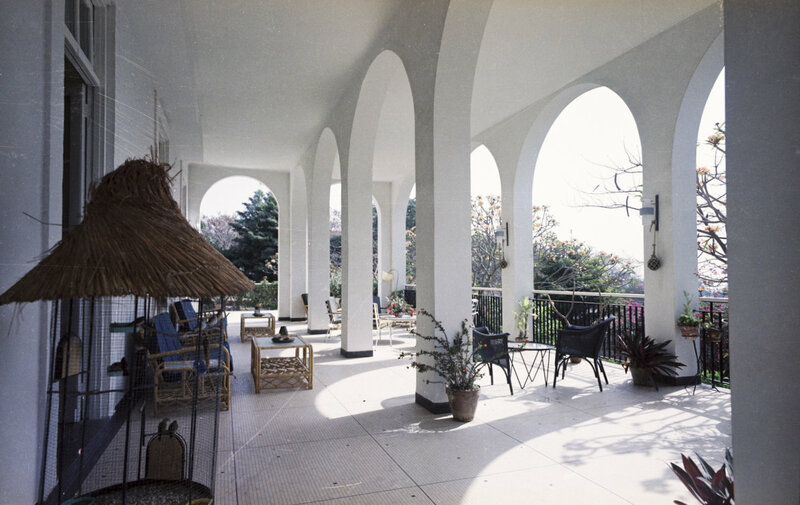 The veranda on the east side was built in 1920, and extended in the 1960s. 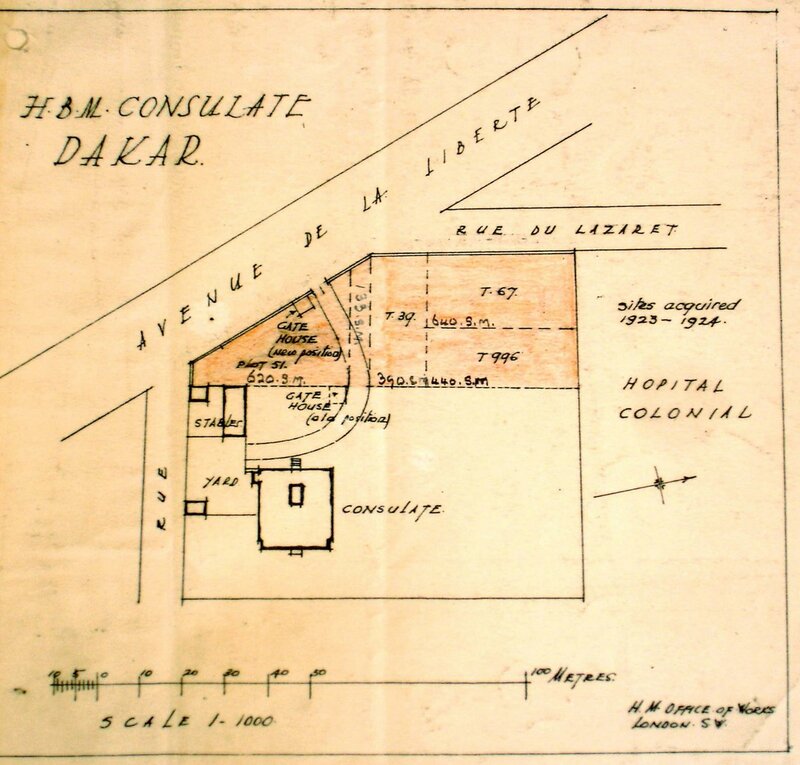 In 1924 the threat arose of three small cottages being built between the consulate’s west boundary and Rue du Lazaret (now Rue du Dr Guillet) ‘with out-door sanitation which would come somewhere close to the wall of the consular premises. They are perfectly hideous, and intended for the use of minor officials and their slatternly wives, whose proximity would be appalling.’ The consul-general, Reginald Maugham, recommended buying the plots at once: his idea was accepted and quickly implemented, thereby also enabling the access drive to be improved. The Post was closed between July 1940 and January 1943 because the French governor-general remained loyal to the Vichy administration, but an American consul, Thomas C Wasson, also representing British interests, occupied the residence between September 1940 and February 1943. After the Post re-opened, a one-storey office building was built in 1943 on the land acquired in 1924, and this was replaced by a two-storey office building in 1958-9, in readiness for the Post becoming an Embassy upon Senegal achieving its independence in 1960. The land between the consulate’s east boundary and the Corniche was bought in 1973 and incorporated into the residence garden, and a swimming pool built on it in 1976. David Snoxell, ambassador 1997-2000, gave a thorough account of the trials and tribulations of establishing the Dakar consulate in ‘British Representation in Dakar 1872-1945 and the Rebuilding of the British Residence’, an unpublished FCO typescript, 2000. 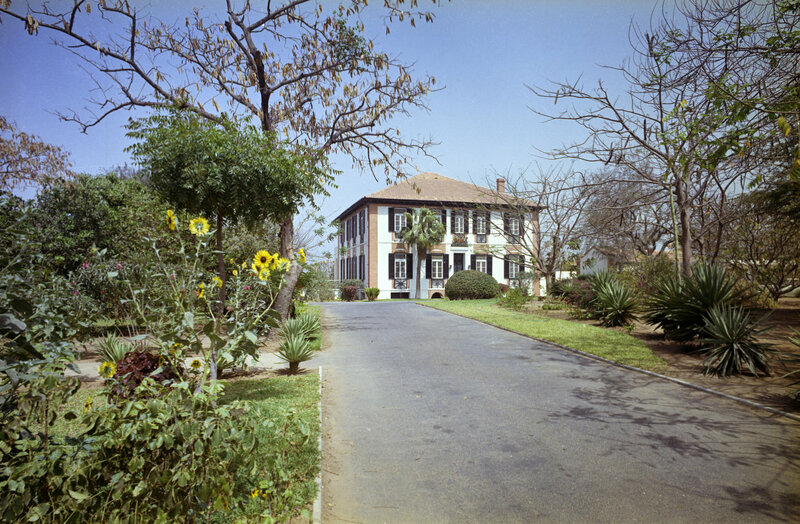 Entrance approach to consulate, 1965. Veranda, as extended, on the east side, 1965.